The last book I tried to read set at the time of the Black Death in the Middle Ages was so depressing I had to abandon it. The Last Hours, thankfully, was very different. Minette Walters is a fabulous writer. You felt that she was being true to the times while using accessible normal English. This has been criticised in some reviews but I think it helps the story a lot. The story has an inspiring heroine and an incredible villain. The fate of the villain is left in the balance at the end and there will be another book – which I will be looking out for. I couldn't find out what it is going to be called. Previous novels by this author have been in the crime genre – and she does know how to build suspense. 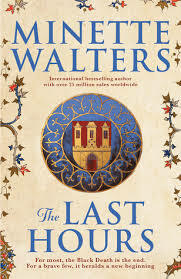 The Last Hours sounds interesting - have you read The Domesday Book by Connie Willis? You felt that she was being true to the times while using accessible normal English. This has been criticised in some reviews but I think it helps the story a lot. OOooo! It's been a hot minute since I've read a book set in this times.